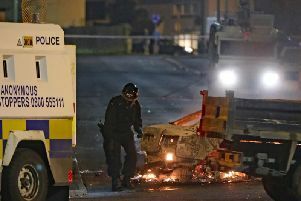 Detectives investigating dissident republican terrorism have seized a large quantity of suspected drugs in Northern Ireland. One man was arrested following the search of a house in Rossnareen Avenue in west Belfast today. The 30-year-old man was arrested on suspicion of possession of class A and B controlled drugs with intent to supply. He was taken to Musgrave police station in Belfast for questioning. The senior detective added: “We are committed to tackling and disrupting criminality linked to violent dissident republicans and bringing terrorism, in all its forms, to an end. “We are committed to making Northern Ireland a hostile environment for those in our community who are involved in serious drug crimes and anyone involved in the drugs trade, or anyone tempted to become involved should be under no illusion - we will seek to identify them, arrest them and place them before the courts. He said those involved in this type of criminality did not represent the interests of the community.